Many cats are living longer lives, and unfortunately, are acquiring diseases that were not seen as commonly in the recent past. Hypertension (high blood pressure) is one of these diseases. The increase in blood pressure affects many organs, particularly the liver, eyes, kidneys and heart. Hypertension hastens the progress of these diseases and substantially predisposes your cat to blindness. We have only recently been measuring blood pressures in dogs and cats, so our database is not as complete as in humanoids. We are at the beginning stages of understanding if an elevated blood pressure is the result of a disease, a cause of a disease, or has no bearing on a disease. High blood pressure can be primary, where the cause is unknown. In most animals though, it is secondary to some other disease, usually kidney disease (Chronic renal failure), and high thyroid (hyperthyroidism). We have a short Quicktime video on the use of our doppler blood pressure monitor. It will take a few minutes to download-you need Quicktime from www.apple.com to view it. The are two main factors that determine blood pressure. It is the amount of blood pumped by the heart in a specific period of time. The determinants of cardiac ouptut are the heart rate(measure in beats per minute) and the stroke volume (the amount of blood in ml ejected with each beat of the heart). In a nut shell, the kidneys secrete a hormone called renin. This can be in response to a decreased blood flow to the kidneys, stimulation of the nervous system, secretion of hormones like adrenaline (epinephrine), or low sodium levels. Renin will activate the conversion of angoitensin I to angiotensin II in the lungs. Angiotensin II will constrict the blood vessels (increased vascular resistance) and stimulate the secretion of aldosterone. Aldosterone will increase water retention by its effects on sodium. Constriction of blood vessels (increased vascular resistance) and increased water retention (increased stroke volume) lead to an increased blood pressure. Pretty easy huh? Abnormally high blood pressure causes blood vessel damage, particularly in the eye, kidney, heart and brain. These damaged blood vessels will bleed, cause clots, fluid buildup, and tissue death. The mechanism for this is complex. Hypertension also places excessive strain on the cardiac (heart) muscle. The heart has to pump against more pressure (vascular resistance), causing further deterioration. as it progresses the heart enlarges and a murmur can be heard with the stethoscope. This can lead to enlargement of the left side of the heart called left ventricular hypertrophy. Eventually congestive heart failure may result. If the target organ is the brain your pet my exhibit depression or seizures. The eyes might show detachment of the retina, hemorrhage, and swollen and tortous blood vessels. High blood pressure can cause the kidneys to leak excess protein and prevent them from removing waste products. This is called azotemia. There are no specific set of symptoms of high blood pressure. That's why its called the silent killer in people. What might appear are the symptoms of the disease that is causing the high blood pressure in the first place. The primary symptom some owners notice is a sudden onset of blindness, as evidenced by dilated pupils and bumping into objects. Cats that were apparently fine just a day or two earlier are now completely blind. Prior to the onset of blindness an owner might notice other symptoms. These might include weight loss, excess drinking and urinating, vomiting, change in appetite (up or down) and fast heart rate. Feline hypertension is almost always secondary to other problems, namely hyperthyroidism and kidney failure. The majority of cats with these two diseases will eventually develop hypertension. Any cat that has been diagnosed with one or both of these diseases should also be monitored for hypertension every 3-6 months. Every beat of the heart sends a significant amount of blood to the kidneys. As cats age the kidneys do not function properly, and through complex mechanisms mentioned in the physiology, the blood pressure will elevate. As in people, hypertension is a silent disease. You don't feel ill, and there are no obvious symptoms until it is too late. Fortunately, we have sophisticated medical equipment that will help us make this diagnosis. Found in cats and dogs. There is no breed predilection, but tends to occur more in males and older animals. An examination of the retina by an ophthalmologist will sometimes give an indication of hypertension. There might be areas of hemorrhage or even detachment of the retina. Every blind cat should be seen by an ophthalmologist to check for hypertension, along with other causes of blindness like FeLV, FIP, fungal infections, and Toxoplasmosis. An important tool in the diagnosis of hypertension is a blood pressure monitor. Cat arteries are very small, and the usual method to detect hypertension in people is not accurate in cats. A special blood pressure unit called a Doppler is used. Its basis in principle is the Doppler effect (obviously). The Doppler effect is the change in frequency of a sound wave as it comes towards you then moves away from you. The best analogy of the Doppler effect is the sound a speeding race car makes as it comes towards you, then passes away from you. In the case of a Doppler blood pressure unit, it is the movement of red blood cells through the artery that is being measured. During the frequency change that occurs during this red blood cell flow the reflected sound wave goes from the ultrasonic to the audible range. 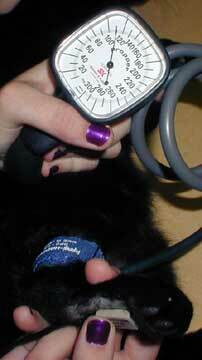 Taking a blood pressure reading on a cat is more difficult than in a person. Their arteries are very small, and of course are covered with hair. Also, cats are easily stressed, which can lead to a false reading. We will routinely take 7 readings, discard the lowest and highest, and average the rest. 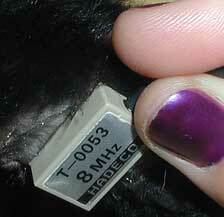 Sometimes we find a cat with consistent readings each time, so not as many readings are needed. 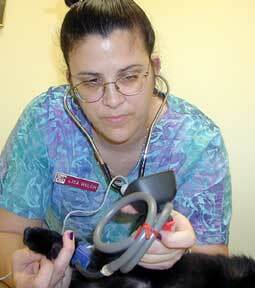 A cat with a systolic pressure over 170-180 mm Hg is considered hypertensive. In dogs we consider over 180 mm Hg to be high. Sight hounds, overweight, and older animals tend to have higher numbers. These are not hard and fast numbers, just a guideline for each individual case. In many cases of high readings we repeat the blood pressure readings a week later to check for consistency in the readings. We prefer owners stay with their cat in one of our quiet exams rooms. After clipping the fur on the bottom of the rear foot (we also use the front foot and tail) we set up our equipment. We take our first pressure reading when everything is calm and all equipment is set up. Our new doppler unit has the added advantage of having head phones so that the sound of the beating artery is not disturbing to your cat. This is an overall view of our equipment. The transducer is under our nurse's hand at the bottom, the blue pressure-wrap is lightly around the ankle, and the pressure gauge is on the top. 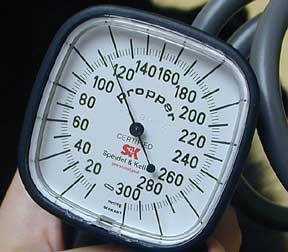 We usually inflate the pressure to over 200 or until the artery sound can no longer be heard. The pressure is slowly released until the artery sound can be heard again- this is the systolic pressure. Measurement of the diastolic pressure is not accurate by this method. The use of the head phones is a big aid in maintaining a stress free environment. When we have obtained an adequate number of readings we can take the headphones off and allow you to listen to the artery sound with the external speaker. If you double click on this video when it is done downloading you can see the doppler in action. Turn up the volume on your speakers since the whooshing sound you are listening for is subtle. The best treatment for hypertension and its associated blindness is prevention. Any cat over 8 years of ago, or diagnosed with kidney disease, diabetes mellitus or hyperthyroidism, should be monitored periodically for hypertension. This will allow diagnosis of the problem before it causes blindness.